ChristChurch Cathedral is the focal point of Cathedral Square in the heart of Christchurch. This place of Anglican worship was designed by the English architect Sir Gilbert Scott. The Cathedral was badly damaged by the earthquake of 22 February 2011. Explore our heritage collection of photographs of the ChristChurch Cathedral, a set of images of the ChristChurch Cathedral, and images on the Discovery Wall website. Reverend Henry John Chitty Harper was appointed Anglican Bishop in 1856. It took him ten years to get the building of the Cathedral under way. The Cathedral was designed by the English architect, Sir George Gilbert Scott (architect of St Pancras railway station in London). The supervising architect was Benjamin Mountfort who redesigned the spire. The cornerstone was laid on 16 December 1864, and the foundations completed in 1865. The money ran out, and some people argued that the Church had more important things to spend its money on. At one point the site was almost sold off. Bishop Harper managed to get building started again by promising some of his own salary to help costs. Leading people in the community supported him and building restarted in 1873, with Benjamin Mountfort, architect of the Provincial Council buildings and other Gothic-style buildings in Christchurch, as supervising architect. Mountfort looked after the day-to-day work on the building site. Sir Gilbert Scott wanted to build the Cathedral in timber, but changed the plans when a good supply of building stone was found in Canterbury. The timber in the roof came from matai (black pine) and totara trees on Banks Peninsula, where it was pit-sawn before being carted to Christchurch. Mountfort wanted to make some changes. The Rhodes family objected. They had put a lot of money towards the project – as well as eight bells and a memorial window – and the original plan was kept. Mountfort made some later changes to the tower and spire, and added some decorative features to the outside. The nave and the tower had been completed and consecrated. The addition of the chancel and the transepts completed the building in 1904. A west porch designed by Mountfort had been added in 1894. The final cost was £65,572. The Cathedral was affected by earthquakes on 5 December 1881, 1 September 1888 and 16 November 1901. Each time the spire was damaged. After the 1901 earthquake, the top of the tower was replaced by hardwood sheathed in copper. 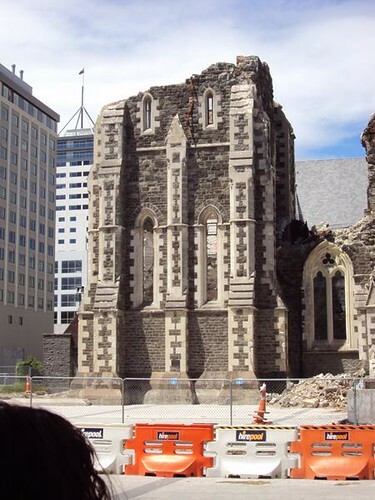 The Cathedral suffered minor damage in the earthquakes of September and December 2010, but was devastated by the 22 February 2011 earthquake. No one was killed in the building. One injured person was rescued from a room in the belltower. The building measured 61 metres by 21 metres with the 62.5 metre tower the dominant external feature. The tower was 36 metres high and the spire 27 metres – a total of 63 metres from the ground to the cross at the top. The tower housed 13 bells, the heaviest of which weighed 1.77 tonnes. The nave was about 100 feet long, and the circular stone staircase to the tower had 133 steps. The West Porch was a benchmark for Christchurch as it is 6.192 metres (20.314 feet) above mean sea level. The dignity and beauty of the interior of the Cathedral was enhanced by many fine features including the high altar flanked by three wooden carvings and the pulpit with its four white alabaster carvings. The font was given by Dean Stanley of Westminster Abbey in memory of his brother Captain Owen Stanley. At the west end of the Cathedral was the Rose Window which represented the different orders of Angels. Underneath were the mosaics, made in Venice, representing the six works of Mercy. In the North Transept of the Cathedral was a recumbent statue of Bishop Harper, first Bishop of Christchurch, and some striking modern stained glass. In the South Transept were two statues of St Michael and St George. In 1898 two plane trees were planted in the grounds on the south side of the Cathedral by the Christchurch Beautifying Society. Interior and exterior refurbishing of the Cathedral was completed in 1979. The chancel was restructured in 1988. The Cathedral’s centennial and its significance in the life of the city was marked by a visit by Queen Elizabeth II on 13 October 1981. Alongside the Cathedral was a Visitor’s Centre which was officially opened by the Queen on 4 November 1995. The centre, designed by Christchurch architect Alun Wilkie, was constructed at a cost of $1.4 million. The Centre was to help accommodate the more than 300,000 visitors who visited the Cathedral annually. The centre housed a shop, restaurant, display and exhibition area, and provided an appropriate reception and information area for visitors to the Cathedral. A columbarium was built in 2000. A columbarium is a wall built with places to hold people’s ashes. ChristChurch Cathedral had 13 bells and a team of bellringers. The bells were rung for many religious occasions and also special events like the arrival of the godwits in spring. The Cathedral has the only professional choir of boys and men in New Zealand (one of only two in the Southern Hemisphere). The Cathedral has played an important part in the life of the city as the venue for many official events. In more recent years, it has been a venue for musical performance and also for the annual floral festival. 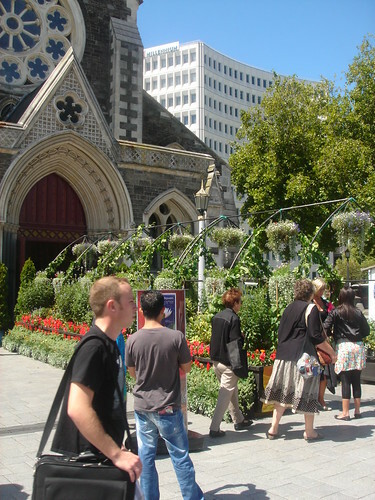 Here are some photographs of the 2010 Floral Festival showing the Cathedral. In the aftermath of the February 2011 earthquakes, a decision was made to partially demolish the Cathedral. The deconsecration ceremony took place on 9 November 2011 in front of 200 invited members of the cathedral community. 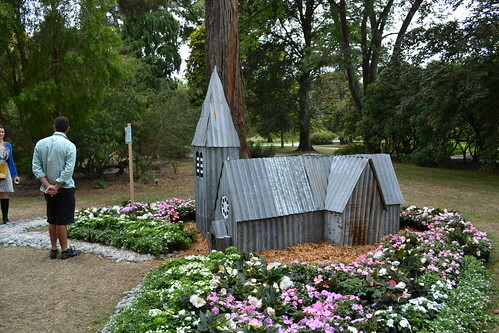 The Anglican Church has built a temporary ‘cardboard cathedral’ on the site of St John’s Anglican Church in Latimer Square. St John’s was demolished after being badly damaged in the February 2011 earthquake. The Transitional Cathedral designed by Japanese architect Shigeru Ban, was opened on 6 August 2013 with a Diocesan dedication service. 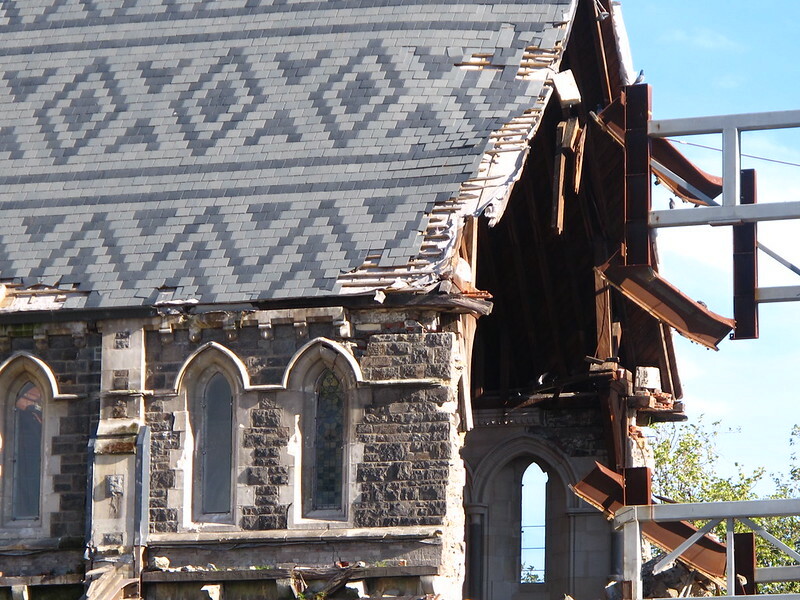 In September 2017 after a vote by the Anglican Synod, the decision was made to restore the Cathedral - the restoration to be funded from a combination of insurance, donations, and money gifted by the Great Christchurch Buildings Trust, Government, and Christchurch City Council. Lee, Marian. 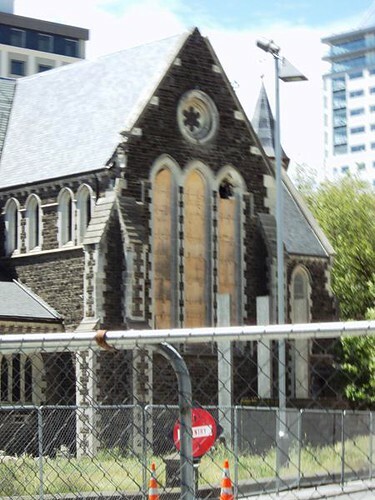 ChristChurch Cathedral, Christchurch, 1997. Federation of University Women, Canterbury Branch. Round the square: a history of Christchurch’s Cathedral Square, Christchurch, 1995. The Christchurch City Council handbook, 1998. 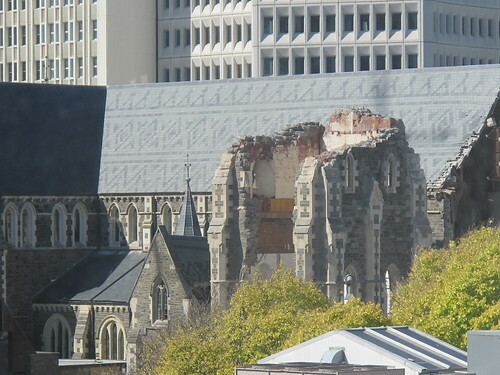 A set of images of the ChristChurch Cathedral. See also our heritage collection of photographs of the ChristChurch Cathedral and images on Kete Christchurch).